Bill Wagner has extensive professional experience in planning and designing a wide variety of civil engineering works, with an emphasis on public infrastructure. 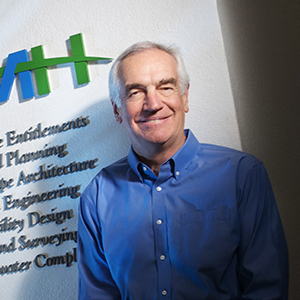 As an HMH Principal for over 30 years, Bill has managed administrative, financial and land surveying functions, and now focuses on his true passion — oversight and design management of major transportation projects. Strongly motivated by the satisfaction of efficient project delivery, he has successfully designed and overseen construction of dozens of arterial road improvements, freeway interchanges, and light rail civil works projects throughout Santa Clara County and the Bay Area. Bill also maintains a strong commitment to professional societies including many years of leadership in APWA and ACEC at the local and state levels.